Even with the set of knowledge and skills acquired from his profession, medical doctor Erric Cinco was not able to escape the wrath of hypertension that runs in his family. Cinco, his cousin (who’s not even in his 30s), and the rest of his family members are all hypertensive. “There is a strong genetic tendency for hypertension. The good news is, knowing my family history, I was very vigilant. I monitor my blood pressure so mine’s controlled. I always take my blood pressure. I didn’t wait for the symptom,” said he said. Cinco debunked the myth that experiencing pain in the nape tells if a person is hypertensive. “That’s not true. That’s minority. The majority of hypertensive has no symptoms. It’s a silent killer,” said Cinco. “If you cannot take a temperature, you can never detect a fever. You cannot detect hypertension, if you cannot take your blood pressure,” said Cinco. “High blood pressure is a silent killer. It is the No. 1 contributing risk factor for global death, causing many cardiovascular complications,” said medical doctor Alberto Atilano, president of the Philippine Society of Hypertension (PSH). Medical doctor Jorge Sison, president of Philippine Heart Association, defined blood pressure as the force exerted by the blood against the inner walls of the blood vessels. “Hypertension is elevated blood pressure above 140/90 mmHg,” said Sison. In the Philippines, high blood pressure remains to be a growing health concern. In the Presyon 3 Target Organ Survey–Philippine Heart Association Council on Hypertension National Survey on Hypertension data published in 2013, it found that one out of every three to four adult Filipinos, 18 years old and above, is hypertensive. Although awareness and treatment among these hypertensive patients are high, only one in every four treated individuals have controlled blood pressure. “In the Philippines, only 27 percent are controlled or protected, the remaining 73 percent are at risk of organ damage. What we want is at least 80 percent,” said Sison. In a National Health and Nutrition Examination Survey (NHES) in 2017, it reported the Philippines is not alone. Even in other Asian countries, hypertension or uncontrolled blood pressure is a problem. In Pakistan, only 5.5 percent of the hypertensive have good blood pressure, 10.7 percent (rural) and 20.2 percent (urban) in India, 13.8 percent in China, 25.8 percent in Hong Kong, 26.3 percent in Malaysia, 31.7 percent (men) and 42 percent (women) in Japan, and 36.9 percent (men) and 49.4 (women) in Korea. The highest percentage of controlled BP was recorded in Taiwan at 70.2, followed by Singapore at 69.1, and 60.4 in Taiwan. Globally, hypertension is the leading cause of death. “It doesn’t spare anyone whether you belong to a high, middle, or low socio-economic status, you’re not immune. 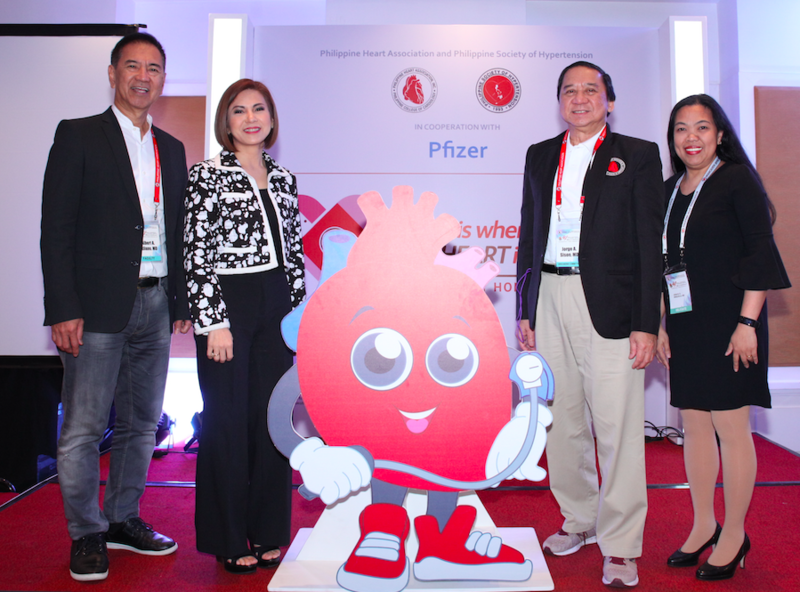 Everyone is vulnerable to having hypertension,” said Sison. Hypertension is the major cardiovascular risk factor. If left untreated, it can lead to progressive organ (kidney, heart, brain, blood vessels, including the eye) damage, clinical signs of disease, and life-threatening cardiovascular events. “I have some patients who went blind because of uncontrolled high blood pressure. Age is also a risk factor. As we grow older, we develop increased resistance in our blood vessel because of arteriosclerosis, aging, etc. Blood pressure goes with age as well,” Sison added. The risk factors for hypertension include family history, advanced age, overweight and obesity, diet (especially excess salt), lack of physical activity, smoking, too much alcohol, drug intake, and other diseases (kidney, renal, or endocrine). Presyon 3 data also found that 40 percent of people with high blood pressure have a family history from either the father, mother, grandparents, and other relatives. “Hypertension has two sources: there’s modifiable and non-modifiable risk factors. Non-modifiable, you were born with it, it’s in your genes. High blood runs in the family, we cannot do anything about it. But there are modifiable risk factors such as lack of exercise, poor diet, and you can change that.” Cinco said. HOPE Asia (Hypertension Cardiovascular Outcome Prevention and Evidence in Asia) Network, which consists of 20 expert members in Asia, emphasizes the need to monitor blood pressure at home using electronic or digital gadgets. “Home is where the heart is. We would like you to monitor yourself at home, not just monitoring your Facebook, text messages every day. You also have to watch your blood pressure. That’s what I tell my patients when they come to see me for a check-up, check your blood pressure at home. It matters a lot more than anything rather than just relying on blood pressure gadgets in my clinic,” said Sison. Sison, however, emphasized that there are conditions that must be met when taking blood pressure at home and not just sitting down. “Before BP measurement, you cannot smoke or drink coffee for 30 minutes, no exercise for 30 minutes, and rest for at least two minutes, avoid eating, and empty bladder. When using HBPM [home blood pressure monitoring], BP is to be measured at the same time in the morning and evening for five to seven days. Overall home value equals the average of BP values over five to seven-day monitoring period,” said Sison. Studies have shown that HBPM is able to predict occurrence of possible complications than clinic BP, increases in BP levels in morning, as measured by HBBPM, is better able to predict prognosis than clinic BP. “To get an accurate BP reading, one should get correct cuff size, refrain from talking, back/feet are supported, legs uncrossed, arms at heart level, and cuff on bare arm,” said Sison. “Lifestyle change is a big contributor in proper BP control. Unfortunately, success rate of lifestyle change alone is 15 percent. It’s difficult to depend on lifestyle. There are medicines on that, but when you don’t have means to buy them?” said Atilano, adding that the Department of Health gives free medicines in barangay (village) health centers. Although there are issues in the efficacy with some medicines, Atilano said it is better than not taking at all for the reason that they cannot afford to buy them. In line with the PSH participation in the global initiative called May Measurement Month, which is spearheaded by the International Society of Hypertension, Atilano shared how the local society is reaching out to all Filipinos to encourage screening for hypertension. “We are very active on this. We have hypertension caravan for the lay people all over the country, and seminars for the doctors. Working together, we will realize our objective to improve awareness and control high BP,” said Atilano. Atilano shared that the Philippines is one of the global leaders, and the No. 1 contributor with 271,604 surveyed data (22.6 percent of the global pool of 1.2 million) in a global cross-section survey participated by 97 countries in 2017. “Globally, 34 percent were screened to be hypertensive, 17.3 percent are hypertensive but not receiving treatment, and 46.3 percent receive treatment but with uncontrolled BP,” said Atilano. The study is the largest ever synchronized, standardized multinational screening survey of any cardiovascular risk factor and it allows exploration of potential associations between BP levels and other environmental factors including day of the week, and other participant characteristics (comorbidities, lifestyle). Friends since we were 18-19 years old. It’s been 20 years.